Issues of the short-lived but fascinating periodical of the Swing Era, The Jazz Session, are exceedingly rare—they provide photos, often published nowhere else, contemporary reviews and articles on Jazz's earlier styles. 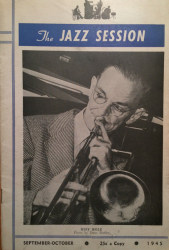 This issue features the great hot trombonist Miff Mole on the cover. The photo is by Duncan Butler, a good friend of Dicky Wells. The magazine also includes an article on Bobby Hackett! RARE and precious! Phil is one of the last persons around who spoke with Miff Mole. If you buy this, then Phil will use the phone numbered supplied to call you and tell you of the funny conversation he had with Miff Mole over 60 years ago!